Product #1277 | SKU EFS1022 | 0.0 (no ratings yet) Thanks for your rating! Durable digital lens with ultra-wide zoom. 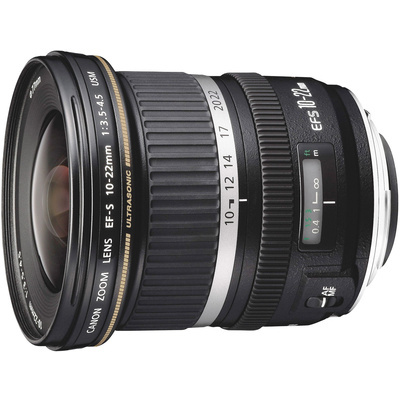 The Canon EF-S 10-22mm f/3.5-4.5 USM is an ultra wide-angle zoom lens with dynamic expressive capability for all EF-S mount digital EOS cameras, exceptionally small and lightweight for maximum mobility. Features three aspherical lens elements (two types) as well as a Super-UD glass element for high image quality at all focal lengths. Optimized lens coating minimizing flare and ghosting prone occurring with digital cameras. Not suitable for 35mm film SLR cameras, or for 35mm size "full-frame" digital cameras, e.g. 1Ds or Kodak Pro SLR/c. Not suitable for 35mm film SLR cameras or digital camera with image sensor bigger than APS-C size, only fits on the EOS Digital Rebel series or 20D, 30D, 40D and 50D, 7D SLR cameras.